Good morning from wonderful and cold Hamburg. Tomorrow will be Christmas Eve in Germany while the suitable snowy weather makes everything more traditional and beautiful. Anyways, we wish you a merry Christmas time and a successful last trading day for this week. The NZD fell to its lowest level in more than three months against the USD after the economy posted a report that showed a lower-than-expected 0.2 percent growth in the third quarter. The USD also gained against the AUD after a U.S. government report showed better-than-expected sales of existing homes in November. The USD continued its gains against the EUR after a survey showed that U.S. sales of new homes will probably rise to a 438,000 annual pace in November from 430,000 in October. Yesterday the EUR/USD fell for a sixth day while trading today near unchanged around 1.4250. The AUD/USD fell for a third day and reached a low at 0.8744, which was the deepest level since the beginning of October. The NZD fell also to a record low against the USD after it reached a low at 0.6975, the lowest price since the middle of September. The NZD fell also against the JPY after New Zealand’s Finance Minister Bill English said that the nation’s economy recovery would “remain fragile”. The NZD fell for a third day against the JPY and reached a low at 64.05 after opening at 64.23. The JPY rebounded against some major currencies while investors are speculating that Japanese exporters are bringing back earnings overseas before the year-end. The USD/JPY fell for the first day since December 14th after it pulled back from a high at 97.87, which was the strongest peak since the end of October. 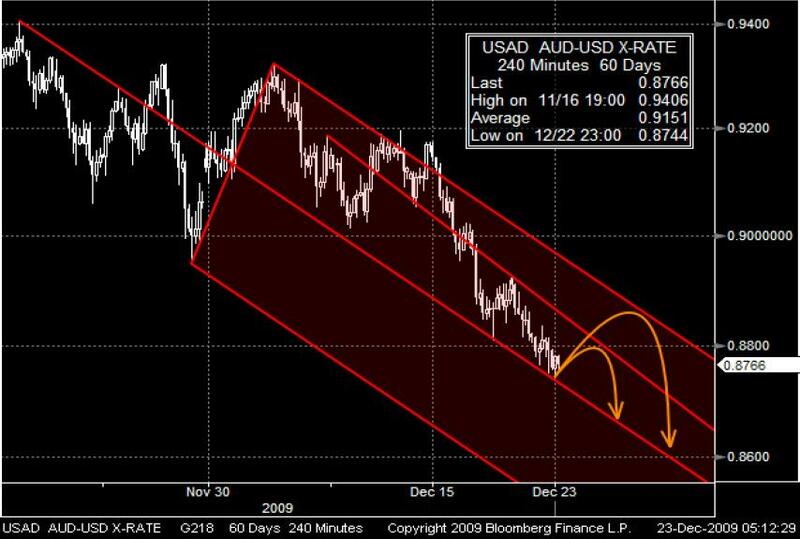 Since the beginning of December, the AUD/USD has been moving inside a bearish pitch fork including a bearish trend line. After touching the simple bearish trend line for the second time, the market fell back and touched the middle line of the pitch fork. If the pair does not break the middle line of the pitch fork, it may stay bearish inside the upper channel with two resistance lines. 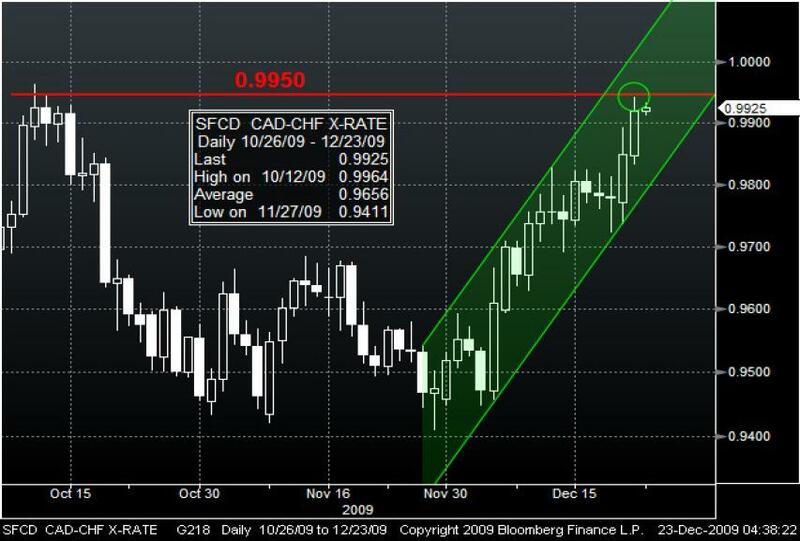 As you can see, the CAD/CHF has been moving inside a bullish trend channel for the past two months. After touching the lower line of the channel, the pair has reached the resistance level around 0.9950 from October. If the market breaks this line, it may continue its bullish trend inside the channel. It probably will get resistance by the upper line of the channel after the break.